Erlanger&apos;s Chattanooga Marathon presented by BlueCross BlueShield of Tennessee is going to be a weekend-long party for runners and fans alike. Friday night, head to the First Tennessee Pavilion for Michelob Ultra&apos;s Kick-Off Party. Runners can register and pick up their packets at the First Tennessee Pavilion and enjoy a special happy hour from Michelob Ultra. 5:00pm-7:00pm: Michelob Ultra Kick-Off Party featuring a FREE outdoor concert from Strung Like A Horse! Strung Like A Horse is not your typical bluegrass band. 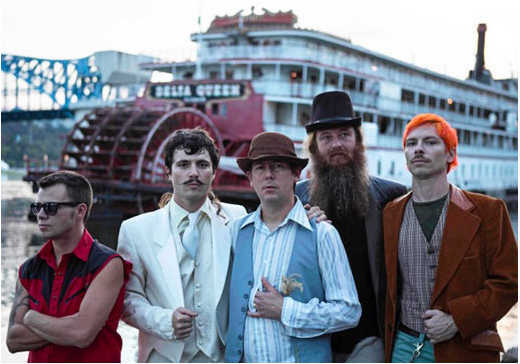 Yes, they contain elements of traditional Appalachia, but combine that with gypsy-influenced rock n’ roll, and you get a fiery sound that is unlike anything you’ve experienced. Clay Maselle’s soulful vocals, combined with the harmonies of the group, harken the crowd to get up and dance. Their energy is electric, making you feel alive, and simply having fun. Sunday is Race Day! Whether you&apos;re running, supporting, or simply looking for some Sunday excitement, head to the First Tennessee Pavilion to cheer on the finish line, check out the expansive vendor expo, grab some delicious food, and tap your toes to some great, live music. All musical performances are free admission located on an outdoor stage, towards the back half of the pavilion. The Knob Creek Girls are Chattanooga’s own Lynn Wamp, Jana Michelson, Kara Miscio, and Christie Burns. For over five years, they have been singing and playing their contemporary arrangements of traditional songs, featuring lush four-part vocal harmonies backed by guitar, hammered dulcimer, upright bass, mandolin, and ukulele. Their sprightly music is sure to get you off your feet and singing on Sunday morning! Rick Rushing & the Blues Strangers are a Blues based Trio out of the scenic city of Chattanooga Tennessee. This trio harnesses the key elements of Blues, Jazz, Rock and Rhythm to create a synergy that lifts audiences to new heights of musical consciousness. Rick Rushing a native of Cincinnati Ohio, is the band leader, vocalist and guitarist. Rick is kin to the legendary Jimmy Rushing the American Blues Shouter and vocalist for the Count Basie Big Band. It’s hard not to love this band. OGYA (pronounced O-jah and means FIRE) brings hot, sultry rhythms of West Africa, the Caribbean and the Americas with high-energy original compositions. Lead singer Kofi Mawuko, a native of Ghana, has toured throughout Africa, Cuba, Europe and Russia. After relocating to the USA, Kofi widened his array of percussion talents by performing with jazz, blues, hip-hop, funk, rock and roll, techno/DJs and bluegrass artists around the Southeast. He has recorded studio tracks for and performed solo with Grammy Award-winning artists, and has opened for international known artists, such as Ladysmith Black Mbazo, Oliver Mtukudzi, Ruben Studdard and The Dirty Dozen Brass Band. Kofi and his Ogya World Music Band will uplift your spirits, letting the music take you away and feed your soul! DON&apos;T MISS ALL THE FUN HAPPENING IN EACH OF THESE NEIGHBORHOODS! Not only does Saint Elmo impress the Chattanooga community as one of Chattanooga’s oldest suburbs, while also being listed on the National Register of Historic Places, this neighborhood also knows how to party! Saint Elmo residents are ready to cheer on the Erlanger Chattanooga Marathon runners, March 5th! Runners, get ready to be greeted by a balloon arch, posters, and cheering! There will be live music to entertain runners and spectators hanging out. Nick Lutsko, a local musician known for his puppet band mates, will be performing from 8:00am-10:00am in support of the Erlanger Chattanooga Marathon and its participants. So come on out to mingle with neighbors, cheer on the runners, make signs, and jam out to Nick Lutsko as the participants’ race the 2nd annual Erlanger Chattanooga Marathon! "I am a competitive runner, and seeing familiar faces cheering me on is always the highlight of my races. St. Elmo is excited to get to cheer on runners from our neighborhood, all of Chattanooga, and beyond during the marathon this year!" Join the historic Fort Wood neighborhood the morning of March 5th to cheer on the runners of the 2nd annual Erlanger Chattanooga Marathon! Head to the neighborhood’s Victorian Park, where there will be signs and banners strung up all around to support and motivate the participants. The neighborhood also has one of the several water and aid stations for runners to re-hydrate as they take on those last few miles of the race! Solar Moonshine, a local Chattanooga band, will be entertaining runners as they pass through the neighborhood park. Solar Moonshine plays original music and covers rock n’ roll classics with their own creative twist. They are an imaginative quartet consisting of Steve O’Neil on vocals and acoustic guitar, Kathy Webb on vocals and percussion, Rick Hoffman on bass, and Roger Davis on drums. We’re expecting a big turnout to cheer on the runners as they pass the park! Highland Park is an increasingly attractive neighborhood that offers the best of urban living balanced by a friendly, community feel. With their restoration of historic homes, the development of new historically-appropriate homes, and investment into small businesses, this neighborhood has shown explosive growth. Highland Park has an active neighborhood association eager to see the community thrive. With so much positive energy and engaged residents, this neighborhood is thrilled to support the local Erlanger Chattanooga Marathon! Join them on marathon day for a fun party with the streets lined in balloons and posters, and neighbors cheering everyone on, you can’t miss this community’s excitement! North Chattanooga, where hip meets historic, is Chattanooga’s most eclectic neighborhood, originating from the development of Coolidge Park and the downtown riverfront. It is beautifully situated on the Tennessee River just across from the landmark aquarium. Here you’ll find boutiques, restaurants, coffeehouses, galleries, salons and day spas. But the places you’ll find won’t be big box retailers or chain stores. Instead, you’ll find independent one-of-a-kind small businesses owned by passionate locals who you’ll stand a good chance of meeting! At approximately mike marker 12.5, near the Girls Preparatory School, is where you will find the North Chattanooga neighbors supporting our 2nd Annual Erlanger Chattanooga Marathon. Animated from Sterling Avenue to Barton near Island Avenue, there will be music, support posters, noise makers, and food and drinks for volunteers. They are even hosting an artist-led workshop on Friday, March 3rd to guide children and adults in creating signs and noisemakers with Chattanooga themes. So whether you are running or on the sidelines, this neighborhood party is sure to entertain! Listed on The National Register of Historic Places, Ferger Place is Chattanooga&apos;s original subdivision of single-family homes dating back to the 1900’s. It is located next to downtown on the south side of Main Street between Highland Park and Orchard Knob Avenues. There is no better way to spend a March morning than by cheering on the runners of this year’s Erlanger Chattanooga Marathon with this friendly community! You can’t miss their banners welcoming (and saying goodbye) to the runners, and you certainly can’t miss their fun, party atmosphere right in the middle of the neighborhood. So come enjoy the natural beauty of its private park and some refreshments as the participants run towards the finish line! Jefferson Heights is a shining little neighborhood gem in the heart of Southside Chattanooga. From hip eateries, laid-back taco joints, weekly farmer&apos;s market, block parties, outdoor parks, a trampoline playground, and quiet, level streets perfect for cycling and running, the Southside has something for everyone. Join this remarkable neighborhood in celebrating the participants of the 2nd Annual Erlanger Chattanooga Marathon! As the runners near mile marker 25, they will need as much spirited encouragement as they can get to complete the final stretch of the marathon! Want to join the most spirited group of girls on race day? Then head on over to UTC’s campus on March 5th! UTC’s Greek community is activating the campus to show their sorority and school spirit, all while cheering on this year’s participants in the 2nd Annual Erlanger Chattanooga Marathon. They definitely know how to represent the community well, while also being the liveliest group of girls along the course. The sorority that shows the most spirit will even receive $500 towards the philanthropy of their choice! There’s nothing better than representing your school, supporting the marathon athletes, AND raising money for a great cause. Join Jazzanooga for some refreshments and fun in the historic M.L. King district as runners pass through this neighborhood. There will be live music lining both sides of the street of Jazzanooga Arts Space (431 E MLK Blvd) and in front of the beautiful mural located on the AT&T Building.